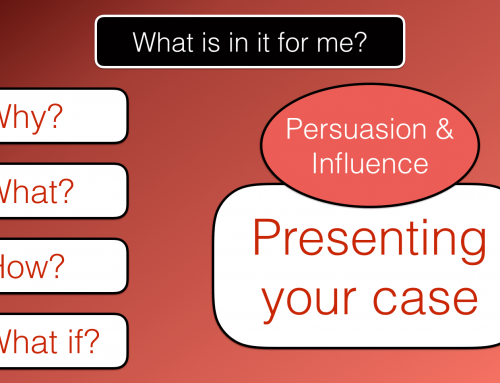 Developing your persuasion & influencing skills. You can probably think of lots of situations in your life when you have tried and failed to persuade someone to do something. What did you do? How did you do it? Why did it fail? I’m assuming that you had good reason to want to persuade them? Not just good reason for you but good reasons for them as well. So how come it didn’t work out? You are about to find out. Was it down to the fact that you couldn’t influence them? Are persuasion and influence the same thing? They are definitely related, aren’t they? 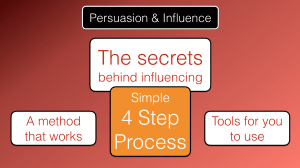 If you have influence then are you better able to persuade someone? I would say that you are and it isn’t the only factor. Gaining influence and the ability to persuade are key communication tools. They are the key to success in sales, marketing, management, leadership and they definitely help in coaching and therapy. 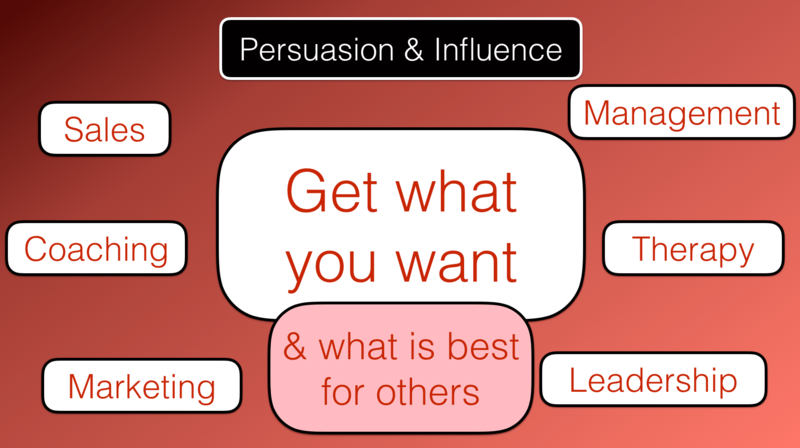 Influence and persuasion help you get what you want. I’m talking about getting what you want for yourself and for other people. Would that be useful for you in any way? Great. You’ve got a great idea. You know that it will help your organisation move forward and you can see clearly that it will help make lots of money. You take your idea to your boss. Straight away you notice that your boss doesn’t like the idea. They reject it. You try to persuade them to think about the idea the way that you do. You tell them how you see it working, the benefits, all the money that it will make the company. They still don’t get it. You are left feeling deflated and totally puzzled by their reaction. What happened? How come they can’t see what a brilliant idea it is? Why won’t they listen to you? 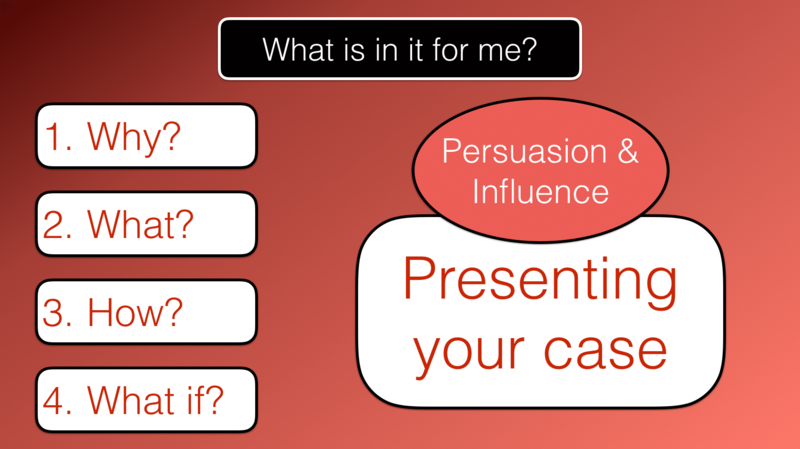 We are going to look at the reasons why persuasion sometimes doesn’t work and you fail to influence, we are going to look at how you can get your message across and influence people. Even your boss! It is Saturday morning. The sun is shining. It is warm. What a great day for a walk in the countryside or stroll down the high street. You ask your partner what they have planned for the weekend. Nothing special. “It’s a lovely day. Let’s go for a walk!” You suggest. “A walk?” They reply. “I was hoping we could get the front room painted and then maybe go to the cinema with the kids.” Do you get to go on your walk? We are going to talk about how to persuade and influence, give you a method and some tools to use in the right circumstances to get your own way. Getting your own way in a sales and marketing environment is the key to success, isn’t it? You have a great product. You have customers who need your product. How do you get them to buy? Selling is about relationships, persuasion and influence. 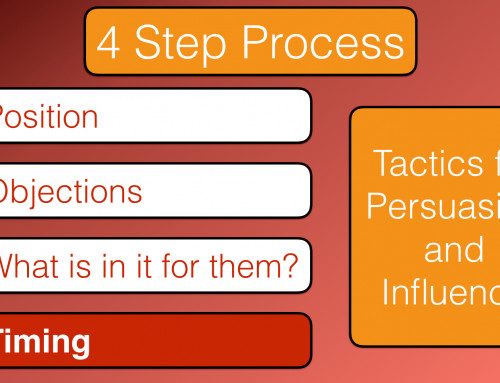 I’m going to give you a simple four step process to follow which will give you the best chance of being able to persuade and influence anyone at any time. The process combines elements of NLP and is based on an objection handling technique that I learned when I was in sales and found hugely successful. 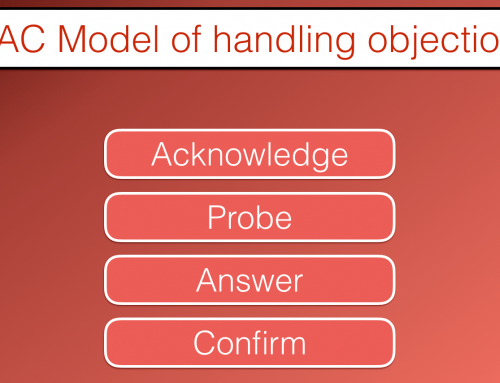 Position – getting in the right position to persuade and influence. Objections – gather any objections early. What is in it for them? – Tell them the value to them of doing what you are going to suggest. Timing – make your request when the time is right. It is important to follow this process sequentially as it is a strategy, a set of tactics that build to the end result. Some people seem easy to influence, others less so. Some people seem impossible to influence and others you need to work at it. Getting your own way through communication can feel like winning a tug of war. Because this is what we are talking about, isn’t it? Sometimes you are much stronger than the opposition and you can win easily. Other times it may not seem like a war worth fighting. Still other times you battle away until you sense a weakness and then you take your opportunity to win. If you are running at a brick wall then you are not going to get through that wall and you are going to get hurt. You need tactics, you need to gain an advantage. You need to approach the wall with caution, get to know it. Does it have lower points out of sight? Is it weak in certain areas? In fact, how long is the wall? It might be worth taking a detour to go around it. In communication with someone there will often be a level of resistance. It maybe really weak, it may completely disappear after a while, or it may be huge resistance. Do you get a sense of what I am talking about? Often it is a feeling that you get. A sense of resistance between you. When you make one suggestion to someone then they may completely accept it without question. When you make another suggestion then they may hesitate before accepting it, they may place conditions on your suggestion. You may have to negotiate a solution in which case you only partly get what you want. Other requests or suggestions that you make may be rejected. You may get an explanation for your rejection, or you may not. It is important to be able to judge this resistance because if resistance exists when you begin to persuade and influence then you will probably fail. The first stage then in the process is to get into the Position to persuade and influence. This stage is about relationship building if you don’t know the person well. If you are marketing or selling then you must first of all build a relationship with the other person. This is about building trust. You must get to know the other person you must get to know what their preferences are in terms of the subject area you are talking about. You must get to know a bit about their background in this area. In sales this means talking about previous purchases that they have made, the reasons for these purchases. In managing and leading people this may mean finding out about good experiences they have had in being lead in the past and less good experiences. In coaching it is about talking about objectives, goals, problems, skills, how they would like to develop. You must switch on your listening skills at this stage. I’m not talking about superficial listening. I’m talking about really listening to the other person. Listen to their judgements, decisions, memories and opinions, setting aside your own. What you think isn’t important at this stage. This is all about them. This part of the process may also be about establishing your own knowledge and skills in the mind of the other person. Ask if they have questions for you. This will then give you the perfect opportunity to demonstrate your expertise and build trust. After they ask you a question and when you are talking then talk about facts, give them information and leave out your own opinions if they differ from those of the other person or just agree with them. This will help you to demonstrate that you are on their side. This is the stage where you establish your position to lead, you must both agree that you are in a position to influence them. The level of trust between you must be strong. The unspoken agreement must be that they are within your sphere of influence. 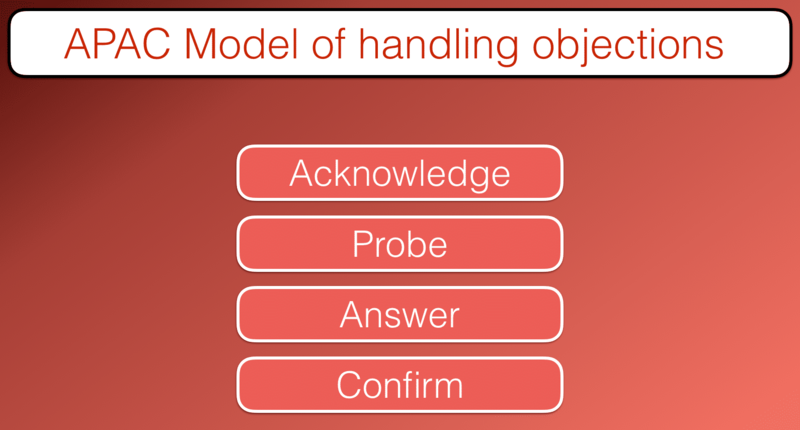 If you know the person well then you may already have completed the first part of this first stage. Your current conversation may be a continuation of previous conversations and part of an ongoing relationship. You can then move on to building rapport. Building rapport is one of the foundations to using NLP (in our NLP training we teach you how to build rapport easily and skilfully) . It is the absolute key to getting results when communicating with others. Research suggests that one of the key elements to successful therapy is the strength of the relationship between therapist and patient. This goes for coaching as well. The level of rapport that you have with someone at the time that you make a suggestion will be the number one factor in whether they accept or reject your request. You can have a fantastic relationship with someone, however if you haven’t got the right level of rapport at the very moment that you make a request then it will probably be rejected. Building rapport is a skill, we spend a week training people on different ways of building rapport in our NLP training courses. 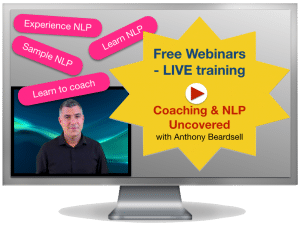 We haven’t got time to go into detail here on all the ways of doing it however I encourage you to learn it and you can do that by taking one of our NLP courses. We have online options as well as live courses in the UK. The key elements in NLP based rapport are that you match and mirror the other person, You pace the other person’s (or people’s) model of the world. You match and mirror their body language, their words, the language that they use. Once you have matched and mirrored (paced) them effectively then you will have established an energetic relationship between you at that moment. You will feel the rapport and the positive energy between you. You can then test that you are in rapport by leading them. If they follow you then you are in rapport and you can move on to the next stage in the process. I’ll explain this in a bit more detail. You can match someones body language by sitting or standing the way that they are sitting or standing. If they are sitting down and have their legs crossed, right leg over left leg, leaning backwards then you do the same. If you cross your right leg over left leg then you are matching them. If you cross left over right then you are mirroring them (like looking in the mirror). You would also lean backwards in your chair as they are doing. In addition to the body language you also match the tone of their voice, the words that they use (essentially repeating what they are saying back to them), you match their representational system (NLP term), you match everything that it is possible to match, the speed and volume of speech. This is a skill and takes practice. It isn’t about mimicking them and imitating them. It must take place out of their conscious awareness. Matching in terms of conversation may also include talking about things that you have in common, past history, things and people that you have in common, experiences that you have shared. Once you have the feeling of rapport then you test it by leading them. This means you take them with you somewhere that you want to go. It could mean uncrossing your legs and see if they uncross their legs. It may mean switching to leaning forward in your chair and watch if they do the same. It could also mean switching the conversation to a different subject, leading the conversation towards your objectives and notice if they are still fully engaged with easy, flowing, two-way conversation. Change any of the things that you originally matched and if they follow you then you are in rapport. If you are in rapport and you make a suggestion (that is not obviously contrary to their best interest) then you will meet no resistance. You are in a position to persuade and influence. In marketing terms this stage is about getting your brand across. It is about matching the potential customer to your brand. This means making your brand generally attractive, appealing to them in some way. Can they relate to your brand? Are they familiar with your brand? Does the brand image suit them? Are the sort of products or services that you offer something that they might find useful? Are your products or services in the right price range for them? Once the general resistance has gone then you may make your first tentative approach at influencing and persuading towards getting what you want. 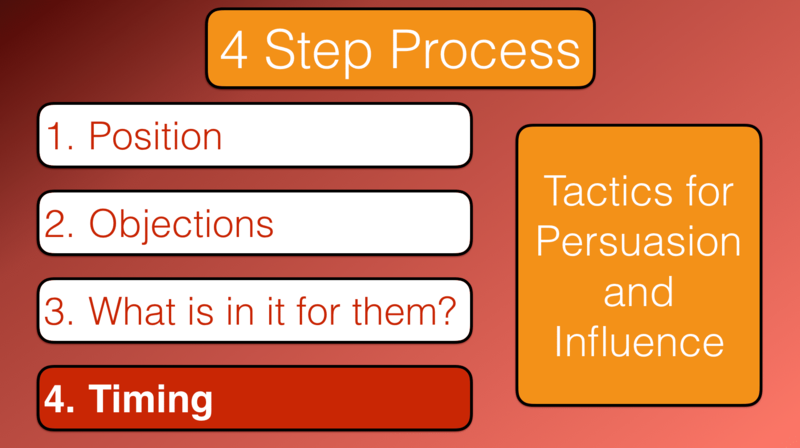 Stage 2 is explained in part two of our Persuasion & Influence series.